Sister Eliza Kenney, BVM died at Mercy Medical Center in Dubuque, Iowa, on Wednesday, Dec. 5, 2018. Visitation will be from 9-10:15 a.m. on Thursday, Dec. 13, 2018, in the Marian Hall Chapel. Sharing of Memories will be at 10:15 a.m., followed immediately by the Mass of Christian Burial. Burial is in the Mount Carmel Cemetery. She was born on Sept. 23, 1932, in Phoenix, Ariz., to Robert and Jean Lobingier Kenney. She entered the BVM congregation Sept. 8, 1951, from St. Thomas the Apostle Parish, Phoenix. She professed first vows on March 19, 1954, and final vows on July 16, 1959. 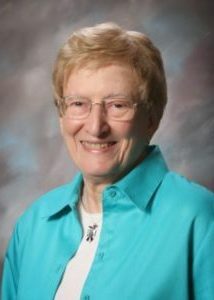 Sister Eliza was music program director within the fine arts department at Loyola University and music department chairperson at Mundelein College, both in Chicago, and music teacher at Our Lady of Peace HS in Saint Paul, Minn. She served as the curator at Mount Carmel, Dubuque, Iowa. She was preceded in death by her parents. She is survived by a cousin; and the Sisters of Charity, BVM, with whom she shared life for 67 years. RIP, dear Eliza. Eliza was my piano teacher at Our Lady of Peace High School in St. Paul, MN, 1957-60. After our lessons, she introduced me to the glories of her native Arizona. Fifty-six years later when I moved to Phoenix, I googled her name and discovered her in a YouTube video talking about the excitement of the founding years at OLP; one delightful email exchange followed. Eliza’s gentleness and love of music (and Arizona!) will always be part of my life.